This example shows how to tune multiple compensators (feedback and prefilter) to control a single loop using Control System Designer. Open the engine speed control model and take a few moments to explore it. 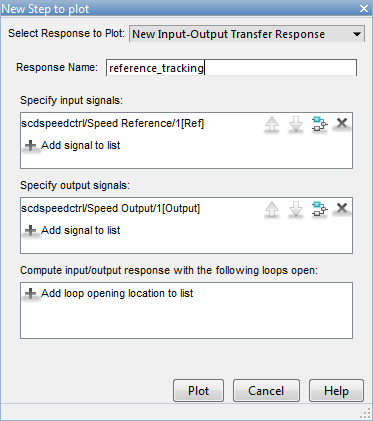 Track the reference signal from a Simulink step block scdspeedctrl/Speed Reference. The design requirement is to have a settling time of under 5 seconds and zero steady-state error to the step reference input. Reject an unmeasured output disturbance specified in the subsystem scdspeedctrl/External Disturbance. The design requirement is to reduce the peak deviation to 190 RPM and to have zero steady-state error for a step disturbance input. In this example, the stabilization of the feedback loop and the rejection of the output disturbance are achieved by designing the PID compensator scdspeedctrl/PID Controller. The prefilter scdspeedctrl/Reference Filter is used to tune the response of the feedback system to changes in the reference tracking. Launch a pre-configured Control System Designer session by double-clicking the subsystem in the lower left corner of the model. Configure Control System Designer using the following procedure. To open Control System Designer, in the Simulink model window, select Analysis > Control Design > Control System Designer. 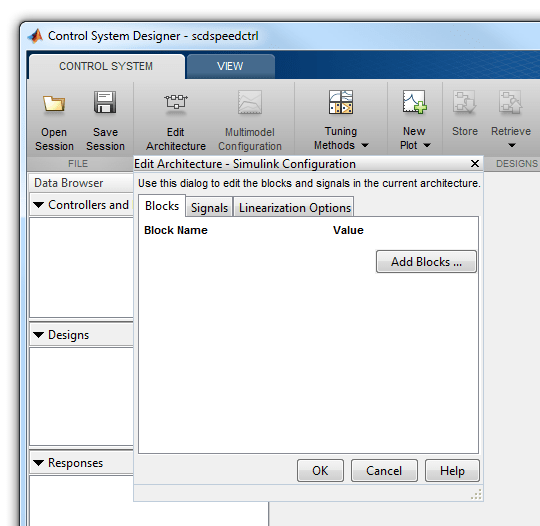 The Edit Architecture dialog box opens when the Control System Designer launches. 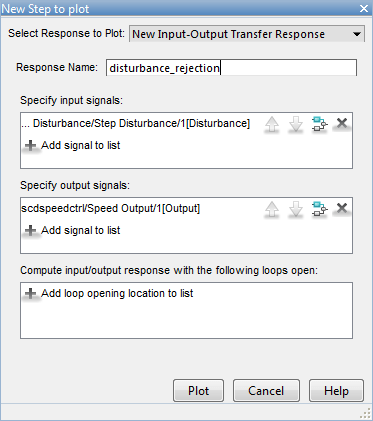 On the Signals tab, the analysis points defined in the Simulink model are automatically added as Locations. On the Linearization Options tab, in the Operating Point drop-down list, select Model Initial Condition. To view the response, click Plot. Manually tune the parameters of each compensator using the compensator editor. For more information, see Tune Simulink Blocks Using Compensator Editor. Graphically tune the compensator poles, zeros, and gains using open/closed-loop Bode, root locus, or Nichols editor plots. Click Tuning Methods, and select an editor under Graphical Tuning. Optimize compensator parameters using both time-domain and frequency-domain design requirements (requires Simulink Design Optimization™ software). Click Tuning Methods, and select Optimization based tuning. 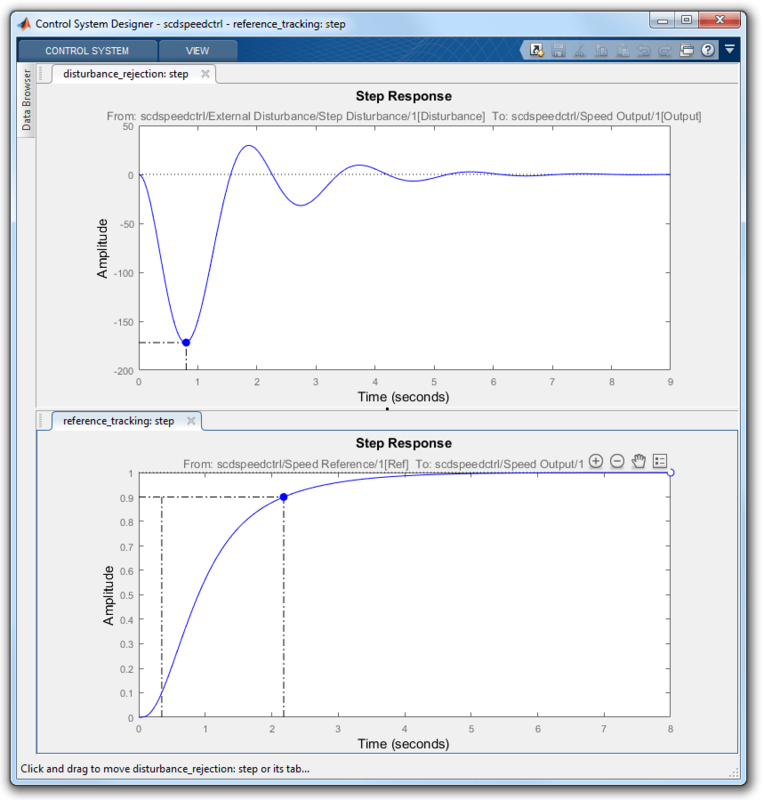 For more information, see Enforcing Time and Frequency Requirements on a Single-Loop Controller Design (Simulink Design Optimization). Compute initial compensator parameters using automated tuning based on parameters such as closed-loop time constants. Click Tuning Methods, and select either PID Tuning, Internal Model Control (IMC) Tuning, Loop Shaping (requires Robust Control Toolbox™ software), or LQG Synthesis. To write the compensator parameters back to the Simulink model, click Update Blocks. You can then test your design on the nonlinear model.